Quantitative Poker: How much "rake" are we really paying in the WSOP Main Event? How much "rake" are we really paying in the WSOP Main Event? It's time to take our utility function out of the realm of hypothetical coin flips and into the real-world, life-changing arena of the World Series of Poker Main Event, where dreams are crushed and careers are made. We are told that every poker player's dream is to win this particular tournament. The only obstacle standing between them and their share of an eight-figure prize pool is the enormous field of competitors that it attracts. We're told that the glory of the bracelet is what we should care about, and the possibility of a huge payday and becoming an instant legend in the game keeps emotional motivations at a high and rational risk management at a low. While the non-financial value of becoming the world champion may be immense, the 1st-place winner doesn't really do that much better than the 2nd-place winner in terms of expected utility on the purely financial value of the prizes. In terms of sudden windfalls in individual wealth, how different are $8.9 million and $5.5 million? As we have discussed, diminishing marginal utility of wealth suggests: not very. Even for the smaller prizes, the real, enjoyable differences between various 5- and 6-figure scores are not nearly as large as they may seem on the payout table, thanks to risk-adjusted utility and its partner in crime, progressive income tax rates. . Somehow, I feel like it might actually be the case that this article is the first time that anybody has taken poker's flagship event and performed a simple expected utility analysis on it. In the unlikely event that any WSOP Main Event participant is willing to temporarily look beyond his or her dreams of poker immortality and actually consider the real cost of the tournament, here's a starting point. After all, the $10,000 entry fee is a significant amount of money for the vast majority of the competitors. Any $10,000 investment merits some careful analysis. His preferences for different levels of wealth are governed by our usual utility function (isoelastic with ρ=0.8) and he is subject to both U.S. Federal and New Jersey State income tax. NJ has higher income tax than most other states, but the effect on the certainty equivalents we produce is not large. His poker winnings for the year (aside from this tournament) are $10,000. This is significant, as it gives him the full tax deduction if he loses the tournament. Since $10,000 is the most he can lose, we can capture higher levels of poker winnings by just modifying his salary, which will have the same effect. His poker skills are such that he is a break-even player and will finish in each possible position with equal probability. If you prefer, you can consider every competitor in the event to have the same level of skill or to be employing the same strategy. In terms of aggregate money lost to taxes and to risk aversion, we don't care which players are actually superior if they all come from the same income situation, and our break-even player here certainly doesn't care about anybody else's utility. After taxes and risk aversion, on average, how much of the $10,000 does our generic competitor get to enjoy? We use the payout data from the 2010 World Series of Poker and apply the above assumptions. Rake — Based on the number of players and the total prize pool, it looks like Harrah's kept $600 of each $10,000 entry in 2010. The $417 net rake accounts for the effects of taxes; since the rake comes out of the $10,000 entry fee, it's effectively a tax deduction, so its real cost is discounted. I've heard some tournament players complain that this rake is too high. That very well may be, but that might be the least of their problems. Tax on Winnings — Based on our individual's tax situation, assuming that he is completely risk-neutral (i.e. temporarily ignoring the discounting of random payoffs under the utility function), he is paying an average of $637 more in taxes by playing in the tournament than he is if he were to not play. If each of the 7,319 players were Americans with similar (low) income as our generic player, income taxes would automatically take a guaranteed 3rd place in the tournament with a $4.6 million dollar payday. Note that this is an average over all possible finishes and includes the overwhelmingly likely outcome that our player gets a $10,000 tax deduction by not finishing in the money! Since he moves into a higher tax bracket when he wins a big prize, the net tax effect is positive on average. Utility Loss (Risk Aversion) — Now we add his risk aversion into consideration and look at his expected utility after rake and taxes. This is where he really gets hurt. $2,380 could buy lots of nice things, but that's how much must be thrown into the consuming flames of "variance" in order for our generic competitor to take his shot at the big game. Diminishing marginal utility of wealth is a big deal when we're looking at seven-figure payoffs. For example, the after-tax utility of the 1st-place prize of $8.9 million is only twice as much as that of the 82nd-place prize of $79,806! That means that a player with this income level and risk tolerance would be indifferent between taking $79,806 for certain and taking a 50% chance at $8.9 million. About 30% of the prize pool goes towards payouts in excess of $1 million to the top 8 finishers, but the additional utility of these dollars is quite small compared to that of the first $1 million. While our assumptions provide a strong caution for the amateur player who has satellited into the event, how about players with different income situations? Let's take the assumptions on net worth, income, and level of risk aversion and vary them one at a time while holding the others constant. Changing the player's net worth affects only the blue slice of the pie, the utility loss due to risk aversion. While the player with $80,000 is losing a lot of equity, wealthier players do significantly better. The player with a $5 million net worth is losing only $392 due to risk adjustments; this might be about the realistic level of wealth where it "makes sense" to play a large-field $10,000 tournament. 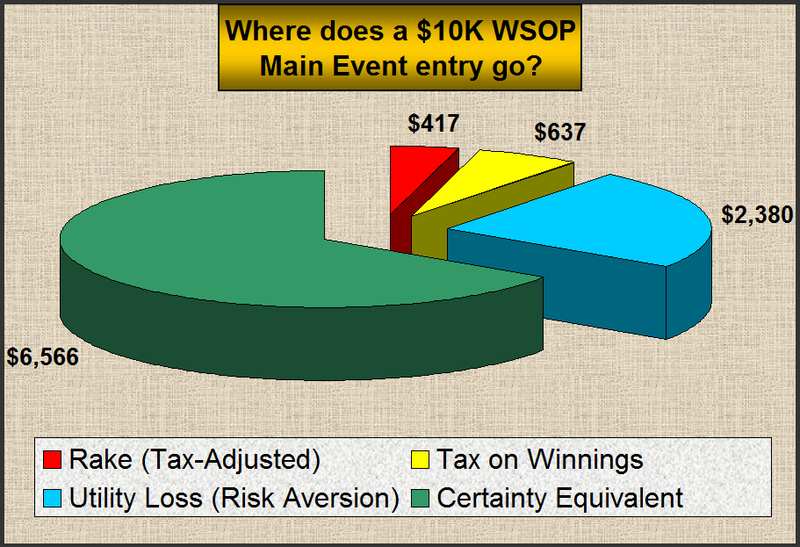 People near or below median levels of income should realize that the level of risk of playing in the WSOP Main Event is essentially too much for them from a purely financial standpoint, as the size of the blue slice of the pie reflects. Increasing income from poker has the same tax effects as increasing non-poker salary (as long as at least $10,000 of income is from poker), so we can look at them together. Higher levels of income for the year help increase the certainty equivalent in two ways: higher wealth leads to lower loss of utility due to risk aversion, and being in a higher tax bracket already helps reduce the negative tax effects of a big WSOP score. For this reason, a higher income for the year makes the tournament more profitable than a similarly-higher net worth, as seen by comparing the two tables. In fact, if his salary is above $510,000, the player is already in the highest tax bracket and no outcome in the tournament will change the player's tax rate. The effect of this is that the tax-adjusted rake (red slice of the pie) is at its minimum of $336, and the average tax on winnings (yellow slice of the pie) is $0. If poker/gambling income is reduced below $10,000, the tax effects become enormous as the player no longer gets a tax deduction for losing the tournament. For the player with no poker winnings to deduct against, the average amount of tax he pays for playing in the tournament is a whopping $3,178. For risk aversion, I found that the value ρ=0.8 for the parameter in the utility function was the best fit for what I expect a normal person's risk preferences to be, but everybody is different and should experiment with different values of ρ for themselves. Lower values of ρ have significant effects on the value of the tournament, but values of ρ that are too low are probably not realistic. As noted earlier, you may not pass up on a 50% chance of winning $8.9 million in favor of a guaranteed $79,806, but when your net worth is as low as our generic competitor, I doubt you'd really require very much more. The typical Average Joe (or Chris, as it were), poster child of the broad appeal of the World Series of Poker, is losing a surprising amount of equity to tax and to "variance" by playing the Main Event. If you're American (or under any other tax system that gives you no deduction or carryover for a net "gambling" loss on the year), you probably just shouldn't play the Main event if there's a significant chance that you won't make at least $10,000 this year in poker otherwise. If you choose to play anyway, realize that you are paying a tremendous premium. And, incidentally, it might help your chances in the tournament to be good enough at poker to have consistent winning years outside of tournaments, but that's another story. Even if you're a successful poker player, consider the fact that, thanks to both taxes and relative risk aversion, your equity in the tournament is significantly higher in years where you have higher income. It might be worth skipping the Main Event during a bad year. Hopeful amateurs, particularly those with net worth under $1 million, should strongly consider whether or not the experience is worth these costs. Of course, for many, it is worth the costs. The experience of competing on poker's biggest stage with players from around the world and from all levels of the game is unique and perhaps priceless to some. None of this analysis should be seen as a slight against the WSOP in particular — the huge fields and prizes are what create the appeal of the event, and any other large-field big-buyin tournament would annihilate collective utility in a similar fashion, though perhaps to a lesser extent. Much of the value of the World Series of Poker Main Event is non-financial, and there's nothing wrong with that. Just be sure to consider this against the real hit to your bank account and your economic happiness. How could we quantify the external benefits and costs of various outcomes? For example, it would be easy to incorporate sponsorship bonuses, dealer tips, and travel expenses into the payouts. We could even try to quantify intangibles such as the expected future marketing value of a strong finish, or even the personal value of becoming world champion. How much better can our equity get if we sell shares of ourselves? What if we had a backer? I expect that these hedges can easily provide very significant reductions in the loss of utility due to risk aversion. And, of course, the 10,000-pound donkey in the room: Our skills might be better than that of the rest of the field. As our pure expected value in the tournament increases, so will our expected utility. In this article, we've considered only the player who has an equal chance of finishing in any of the 7,319 places. I am working on creating some realistic probability distributions on the place finished in the tournament as a function of a player's EV-edge on the field. Once we have a reasonable function, we can look at some interesting and extremely important related problems. For a given projected skill edge, what's our certainty equivalent of playing the event? For varying personal income situations, what's the minimum skill edge needed to be able to profit from playing the Main Event? (06/08/2011): I look at the effect of skill edges and optimal hedging ratios in my followup to this post, located here: WSOP Utility Analysis revisited, part 2: How many shares should a WSOP Main Event player sell off? How far from Gaussian (normal) are poker results? Poker & Pop Culture Now Available for Preorder! Are online casino reviews trustworthy? What makes poker a great game? All content by Mike Stein except where otherwise noted. All rights reserved. Simple theme. Powered by Blogger.